I’ll start by saying I’m addicted to deck building games. Dice building games, too, but that’s a different topic. With The Lord of the Rings Deck Building game, a welcome and enjoyable addition to my collection has been purchased. 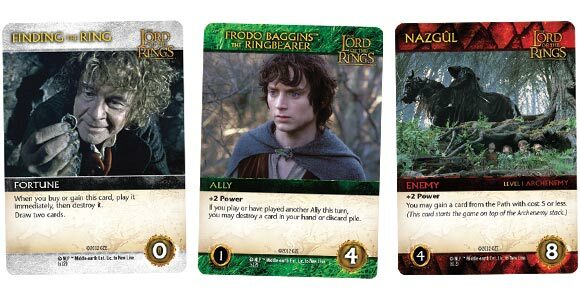 Using the Penny Arcade engine, which seems to be most well known via the DC Deck Building Game, Cryptozoic has added some welcome mechanics that take LotRDBG into a more breathless realm as added dangers lurk with every reveal of every card. This new mechanic wreaks havoc with the next player, often causing great strife to that player’s strategy, and really adds a sense of dread to the overall game play. No matter your opinion of DC Deck Builder (I enjoy it as the light filler it is), you owe yourself to play LotRDBG at least a couple of times. It’s familiar, fun, and nasty. What more can you ask of a game?! The Lord of the Rings is another deck builder game, with a few fun differences. We at my store have come to the understanding that the only way to play this game is in impossible mode. It has a normal mode and it’s ok to learn with, but the game should be played in impossible mode for the full flavor of the game. We play this when we want to lose so bad it is fun. That’s right we want to be hurt by the game. No other deck builder we have found is so punishing to all players for one person doing well. The pain is so bad we have had tears we have had hysterical laughter, but once it is all said and done no other game has us talking about how bad we lost as this game. Winning is nice but being the guy who had 25 cards destroyed by the game including two boss cards, now that is worth talking about. And if you’re wondering, we have seen a player reduced to just the five cards in hand. We are waiting for that one to be beat. A great game for the casual to avid player. When playing impossible let new players know that they will be hurt and that fun is the goal not just winning. This game does share the same deck building mechanic as DC Comics DBG, but that is where the similarity ends. This game is full of welcome and nasty surprises. I will not spoil them and tell you what they are. The pictures from first movie on the cards are awesome. This game will be getting a lot of playing time with my family group and my friends group. DC Comics DBG deserves a little rest. A must have for deck building & LOTR fans alike. Add a Review for "LOTR: The Fellowship of the Ring Deck Building Game"